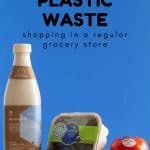 A guide on how to reduce plastic waste when going grocery shopping at your local grocery store. 5 ways to realistically and easily reduce your footprint. Not all of us have a farmer’s market nearby. Farmer’s Markets aren’t around year round, and driving far to get to one kind of defeats the purpose. Also, if you’re lucky like me and live in a country where it’s winter for like at least half a year (*cry*) you’d end up eating no fruits and vegetables at all for months if they weren’t imported. Half Your Plate Canada invited me to this year’s Canadian Produce Marketing Association Trade Show to find out about all the new and innovative things happening in the produce industry. “Half Your Plate is a new healthy living initiative that empowers Canadians of all ages to eat more fruits and veggies to improve their health while providing simple and practical ways to add a variety of produce to every meal and snack”. Quote. You all know I’m a HUGE advocate of exactly this as well. If you’ve been following Green Healthy Cooking for a little while you most likely work towards making this happen or are already successful at it, too! By filling half your plate with fruits and vegetables you are already reducing your footprint massively. However, there is more that can be done, while shopping for exactly those items. One thing I was VERY excited to see this year at the trade show are all the advances the industry has made in terms of packaging. They are clearly steering in the right direction to reduce plastic waste. I applaud the produce industry for it and encourage everybody to help this trend continue developing. For myself and readers of Green Healthy Cooking, these are the types of things we do while grocery shopping or have been striving for. So it’s great to see the industry listening to the public and educating people on the various ways we can all help Mother Nature. The produce industry is finding new innovative ways to package and transport produce for us in the most environmental-friendly way possible while at the same time protecting the produce on its way and increasing its shelf life with the correct packaging. It’s our job to choose the correct packaging to signal that this is what we all want. For large whole fruits and vegetables try and choose the unpackaged produce. For transportation, most of it is packaged into one large cardboard box and sometimes a plastic rack to keep produce separate and in place, such as large tomatoes to avoid from arriving like tomato puree. That’s better than individual bags, however. By far my favorite innovation I think is by the company Sinclair. So far the stickers on produce were not even recyclable because of the adhesive. In previous years labeling companies were able to produce recyclable labels but as soon as the adhesive was applied they stopped being recyclable. NOW…. the stickers are COMPOSTABLE! Isn’t that the most amazing thing ever? They degrade in 90 days. That is a huge step in the right direction. Often times even compostable and recyclable packaging has non-compostable and non-recyclable components. 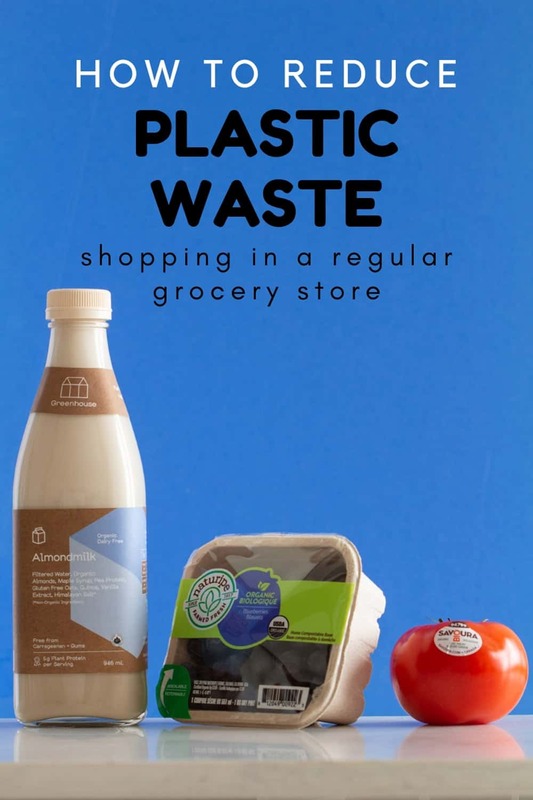 Buy the products and produce that is packaged in as much compostable or recyclable packaging as possible. For example, the brand Greenhouse sells its almond milk and kombucha and juices etc in reusable glass bottles with plastic caps. Same, with Litehouse. They sell almost all their spice mixes and dressings in reusable and recyclable glass containers now. Chose those over plastic! Or companies like Naturripe are starting to package their berries in compostable cardboard boxes for grocery store shelves. They are sealed with plastic at the top but that’s already like 95% plastic reduction in their packaging. Sooo amazing. This is by far and hands down the EASIEST way to reduce plastic waste!!! I find this goes without saying and still I see massive amounts of people at the grocery store bagging and DOUBLE BAGGING groceries. Honestly, I feel like fainting when I see this. I haven’t gotten a grocery store plastic bag in years and it’s by far the simplest way to reduce plastic waste overall. The easiest way to remember to bring your own bags would obviously be the government adding an outrageous tax to grocery plastic bags. Something that would make them cost at least $5 each. How often do you think anybody would forget to bring their own bags if each bag cost $5? Wouldn’t that just be amazing? As long as that doesn’t happen, bags will be convenient, and bags will be handed out like there is no tomorrow. YOU have to make and be the difference. Have a reusable bag hang right next to your jacket. Another right by the door. Another in the car. And another small foldable one in your purse, and maybe even attached to your keys. That way you always have one on hand, even for the quick trips that weren’t planned. There are tons of brands offering meshed lightweight bags in which you can carry your unpackaged apples to keep them together. You know, instead of the super flimsy transparent bags in the produce isles. Here you can find a pack of different size produce bags for example (this is an affiliate link and I might earn a small commission if you buy them through the link at no extra cost to you). Choose your apples and pears and carrots and put them in the bags you brought yourself. Again, I wish the government would put heavy taxes on those flimsy plastic bags as well so they’d just disappear altogether. Many companies don’t have any other choice but using plastic (for now). Reasons can be their produce doesn’t survive the transport. Or shelf life is reduced so much all of the produce would end up creating massive amounts of food waste. OR, their product would become so expensive due to packaging that nobody can afford it anymore. The priority here is: people need to have access to reasonably priced fruits and veggies. As little as possible food waste should be generated. As much recycled and recyclable material should be used. One brand I love love love to work with for example because of that is Mann’s. You’ve seen me talk about them a lot. They are super invested in providing their products in the best way possible for us and the environment and I am very thankful for that. We all still have to go a long way but I’m sure that together, both as producers and as consumers, we can make it happen. Eventually, inventors will find the magic formula to make completely compostable packaging sturdy enough to protect produce and increase shelf life, but at the same time accessible for those of us with a small grocery budget.